framed. Image size 53.5" X 35.5". I completed this large piece earlier this year, 2015, during the coldest snap to hit our area in decades. I've had this image in my mind for several years and needed to find the proper paper and pencil to work with on it. I used a smooth pen and ink paper and the softest Lumograph pencil to achieve all the depths of value. I love working with this pencil as it does not reflect the light as does most other pencils, especially in the darkest drawn areas, plus I'm able to achieve many textural surfaces with it. It is the largest drawing I've ever created, so far. The animals are all creatures I've had the honor to work with in my lifetime, with the exception of the Barn Owl (which I hope to experience some day). 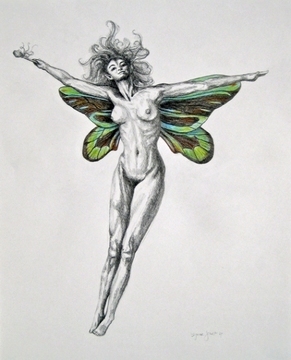 The mythological figure was created in my imagination, as was the environment. She's almost statue- or ghost-like but the animals relate to her on some basic level so she must be real to them. Different stories and narrations run through my head each time I study it, never quite sure what's led up to this precise moment in time, nor what's to follow. Price: $6800, including frame and UV protective glass. 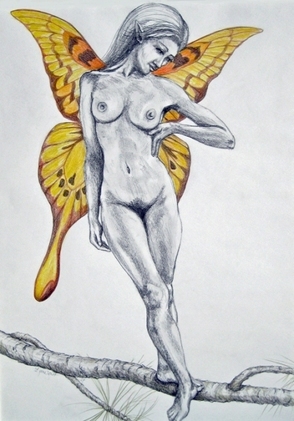 'Bird Wing', color pencil on paper, framed 28" X 22" Price: $500.